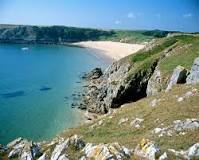 For this weekend we are visiting the beautiful Pembrokeshire Coast National Park. We will depart on Friday after work and make our way west to Pembrokeshire (car sharing will be available for those that need it and options will be announced nearer the time). Our exclusive hire accommodation is Caerhafod Lodge, which overlooks the spectacular Pembrokeshire coastline. The rooms are all en-suite with bed linen. 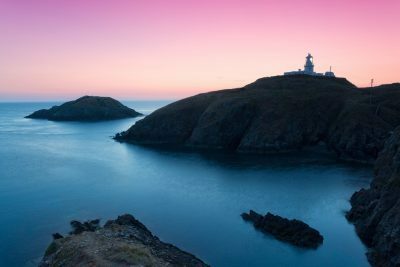 Caerhafod Lodge was opened in 2001 in beautifully converted stone barns, it offers comfortable hostel accommodation within the Pembrokeshire Coast National park. Self-catering kitchen, large sitting room, two stunning sea view patio’s with BBQ. There is a superb, fully equipped self-catering kitchen diner. This comprises of two 4 burner hobs, two Salamander catering grills, one large oven two microwave ovens, two toasters, three electric kettles, one fridge and a fridge freezer. There is also a breakfast bar and there are three refectory tables, all with stools.. If you are self-catering, you will need to bring your own food for breakfasts, dinners and packed lunches. On Saturday after breakfast we will have a short drive to Strumble Head Lighthouse which is the start / finish point of our circular walk. Our route which is about 14km follows the stunning coastal path round towards Pwll Deri hostel. We then head inland before reaching the coast again near Carregwastad Point. The coastal path is then followed west back to the lighthouse. There are opportunities for a dip in the water. 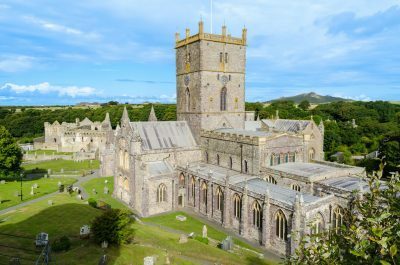 Once back in the transport, we will then drive 30 minutes to St. David’s, the UK’s smallest city, dominated by the impressive cathedral for a quick look round (and a visit to the ice-cream shop!) before returning to the accommodation for hot showers and then most of the group are likely to eat their evening meal at a local pub which will be booked nearer the time – or you can self-cater at the hostel. On Sunday we will leave the hostel and drive to Manorbier, in South Pembrokeshire. Our walk is a 19km coastal path classic. From the car park close to Manorbier hostel we will walk to the coast for the impressive sight of Church Doors Cove, from here we follow the coastal path west passing the beaches of Manorbier Bay, Swanlake Bay, and Freshwater East before arriving at our destination at the stunning Barafundle Bay. There are opportunities for a dip in the water. We will then walk inland to visit to the beautiful Lily Ponds at Bosherston. We depart and plan to be back in London around 8:00pm on Sunday evening.